MCC Photo/courtesy of Sara Stratton. 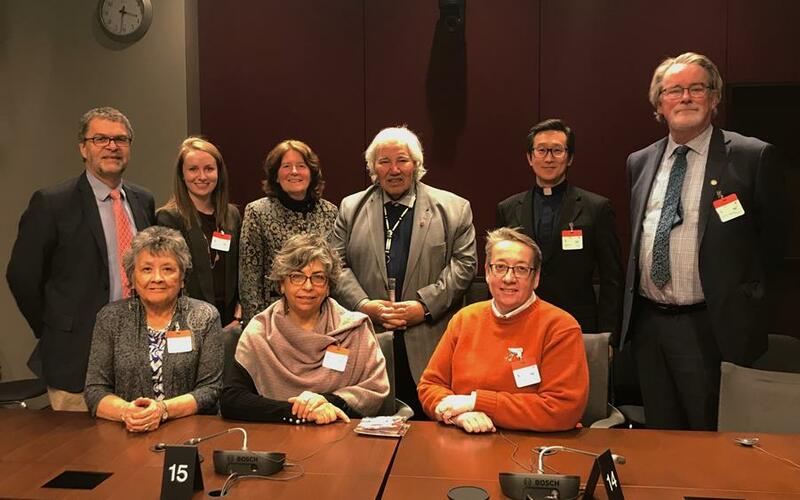 On March 19, 2019, Canadian faith leaders, including MCC Canada Executive Director, Rick Cober Bauman (far left, back row), met with members of the Senateto express their support for the passing of Bill C-262, “An Act to ensure that the laws of Canada are in harmony with the United Nations Declaration on the Rights of Indigenous Peoples.” Here, the group is pictured with Senator Murray Sinclair (back row centre). Canada is presently considering adopting The United Nations Declaration on the Rights of Indigenous Peoples (UNDRIP). The bill to do so, Bill C-262, is currently in the Senate. Bill C-262 is not a formal treaty, but it would change how we share many resources God has placed among us. It would call us to develop consistent and predictable methods of seeking and gaining meaningful input and consent on major development projects that impact Indigenous lands. These are principles that already exist in Canadian law. Among other things, Bill C-262 will help provide a roadmap on how to implement these principles well. In late March, Rick Cober Bauman, Executive Director, MCC Canada, joined other faith leaders from the Quaker, United Church, Anglican, and Presbyterian communities to meet with four Senators and their staff to share how Bill C-262 would provide an excellent framework for reconciliation in Canada’s future. Several senators noted how many letters of support for UNDRIP they had received. If you have not done so, we invite you to have your voice heard too. We are now within a few weeks of this legislation needing to pass before an election is called and the bill dies. This is an opportunity for us shift the trajectory of harmed and hurting relationships in a meaningful way. Senators are paying attention to the messages they receive; let’s continue to motivate them to act. Write a letter to all senators here and read Rick Cober Bauman’s recent blog post about the meetings with senators here. MCC photo/Emily Loewen. An olive tree grows on the farm where Amal Nassar's family has lived for more than 100 years. The farm is near Bethlehem and is surrounded by five Israeli settlements collectively called Gush Etzion. In 1991, the Israeli government declared the Nassar's farm to be state land, and there were plans to expand the Gush Etzion collection of settlements onto the Nassars’ property. The family hired a lawyer and took the case to court. It is still unresolved. The family opened the Tent of Nations on their land in 2000, hosting international guests to work on their farm and to learn more about their life in Palestine. Trade and human rights are closely connected. Where goods and services come from, how they travel, and how they are labelled matters. MCC was one of a number of signatories, including the United Church, Amnesty International Canada, Independent Jewish Voices, and others, to send a letter to the Senate outlining key concerns around Bill C-85, updating the Canada-Israel Free Trade Agreement. While the new agreement contains several commendable sections, including ones on gender and corporate social responsibility, it is missing two essential provisions. 2. A human rights provision, committing both parties to uphold all the contemporary standards of international human rights and humanitarian law. Without those provisions, the current agreement extends the benefit of preferential trade to illegal Israeli settlements in the West Bank, which is contrary to Canada’s obligations under international law. A human rights provision would allow Canada to use its position as a trading partner to create a regular dialogue with Israel which would insist that it satisfy its human rights and humanitarian obligations under international law regarding its military occupation of the OPT. You can read the letter in its entirety here. Bill C-262 is slowly progressing through the Senate and concerns are rising about the short time remaining for due process. We need to remind Senators to ensure that this bill is passed before the senate rises in June. This bill is important not only for Indigenous Peoples of Canada, but for all Canadians. This is a chance to ensure that reconciliation is a fundamental part of our legal system. Add your voice and ask the Senate to pass this bill by using our letter writing tool here. In the fall 2018, the Canadian government appeared to be seriously considering halting Canada’s arms deal with Saudi Arabia. It is now April 2019, and there is still no official word of next steps. In March 2019, Project Ploughshares and 10 other organizations/coalitions sent an open letter to the government: Time for Answers. See more on the Canada-Saudi arms deal from the Ottawa Office blog here. March was a month of many events in the MCC Ottawa office. 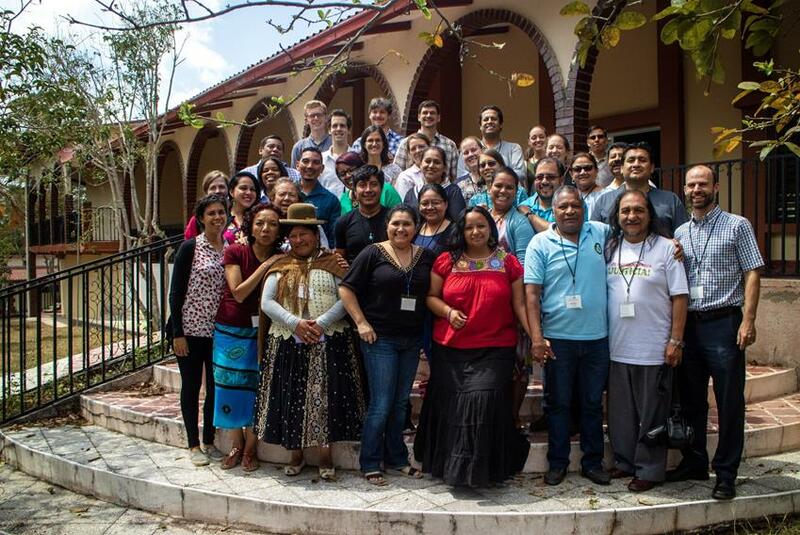 Director Anna Vogt travelled to Honduras for a gathering of MCC partner organizations working on themes related to displacement and migration. Anna and Policy Analyst Rebekah Sears attended an event on Palestine and Israel called “The Two-State Solution is Over: What Next?” featuring Ali Abunimah, co-founder of the Electronic Intifada. This was accompanied by strategy meetings with other NGOs the following day. Advocacy Research Intern Charity Nonkes attended an event at Carleton University where Senator Kim Pate spoke about issues in the criminal justice system and the need for reform. Public Engagement and Advocacy Coordinator Leona Lortie joined a very well attended event in Winnipeg called Manitobans for Bill C-262, raising public awareness for the urgency of this bill.